This 18-hole Robert Trent Jones-designed course gives you breathtaking views of the coast. One of you takes kid-duty while the other gets a few hours of peace. Family favorites (the vacation edition) coming right up. Grab the seats with the best views and order it up. When your bag of tricks runs out, you'll be thankful for the Westin Kids Club. Never tried it? Now's the perfect time. The resort is surrounded by the courses of Makai Golf Club. 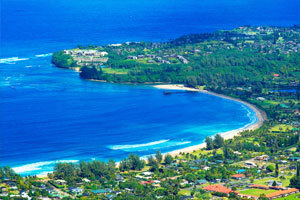 Westin Princeville Ocean Resort Villas is perched two-hundred feet above the Pacific on a north shore cliff. Take a stroll through the beautiful grounds with manicured lawns and palm trees on your way to the pools. There are three outdoor pools, pick one and dive in. The children’s pool has a slide and spouting turtles to keep the little ones entertained while you enjoy a drink at the poolside bar. Wailele Bar is a casual, swimwear-welcome kind of place, open for lunch, afternoon pupu, and tropical beverages anytime you feel the need for something cold and slushy. The resort activities calendar is loaded with options for kids and grownups. Activities include lei-making, yoga, sand art, nature walks and aqua aerobics. The on-site children’s club offers even more fun for the little ones. Studio villas sleep four guests and offer fully equipped kitchenettes with everything you need to prepare basic meals. One- to two-bedroom villas sleep four to eight guests and have full kitchens. Visit the local Foodland, or the on-site marketplace for groceries, baked goods, salads, and sandwiches; you can even pick up freshly-caught fish prepped by the resort chefs to make on the bbq grills The marketplace also serves Starbucks coffee. Don’t feel like cooking? No problem! The on-site Hawaiian Restaurant & Bar features locally sourced, island-inspired cuisine. Flat screen TVs with cable and DVD players provide entertainment, be sure to pack a few favorite movies from home. All villas have Westin’s signature Heavenly Beds and Heavenly Baths with jetted tubs, are air-conditioned and have in-suite washer/dryers. Catch a ride on the resort’s free area shuttle, which stops at the St. Regis, Makai Golf Club, and the Princeville Shopping Center. Have the kids grab their shovels and buckets and get ready to enjoy the beach access available at the Westin Princeville’s sister resort, the St. Regis. Work on your sun-kissed look, or help the kids build sandcastles. The golfers in your party will love the Makai Golf Course. The Robert Trent Jones Jr.-designed par 72 course opened in 1971. A six-million dollar renovation was completed in 2010. Did you forget to pack your clubs? No problem. Rentals from Callaway are available. The Golf Shop features leisure apparel from Nike, Fairway & Green, Greg Norman, and Under Armour. Get ready to shop ’til you drop at Princeville Shopping Center, featuring locally-owned boutiques and dining. Grab an Iced Blended at the Coffee Bean & Tea Leaf, and ask the barista about coffee-free options for the kids. Accessories and apparel can be found at Walking in Paradise, Azure Island Clothing, and Hot Tropics Kauai. Little ones will love the Magic Dragon Toy & Art Supply Store while grownups will enjoy the Princeville Wine Market. Hungry? There’s Federico’s FreshMex Cuisine, Lei Petite Bakery, and Panda Garden Chinese & Thai Cuisine. Reservations are required for massage services and spa treatments. Reservations can be made by contacting the resort prior to arrival, using the contact information on the booking confirmation. Children 17 years old and younger stay free when occupying the parent or guardian's room, using existing bedding. The property has connecting/adjoining rooms, which are subject to availability and can be requested by contacting the property using the number on the booking confirmation. Kauai's north shore is a natural playground for the active traveler, with hiking trails, zip lines, and some of the best golf courses in the country.